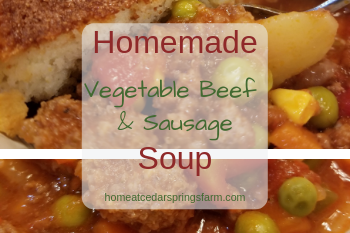 Homemade Vegetable Beef and Sausage Soup is loaded with ground beef, sausage, mixed vegetables, potatoes, onions, and tomatoes. It’s hearty, comforting and so warming on these cold winter days. 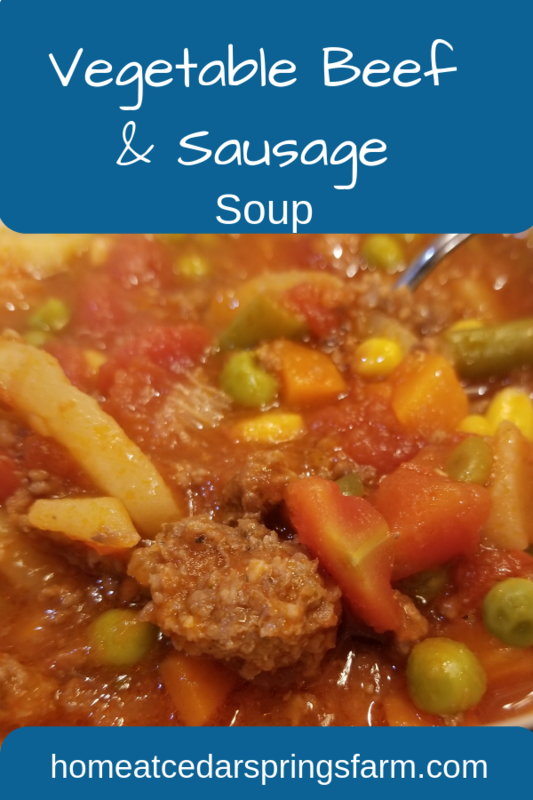 I love a good bowl of soup, and this soup is simple, satisfying and great for any weeknight meal. Plus, it’s made in one pot, and that’s a win-win for me! I used frozen mixed vegetables to make this soup. I only had to chop the potatoes and onion. But, if you have fresh veggies in your refrigerator, use them. You could throw just about any vegetable into this soup, and it would be good. 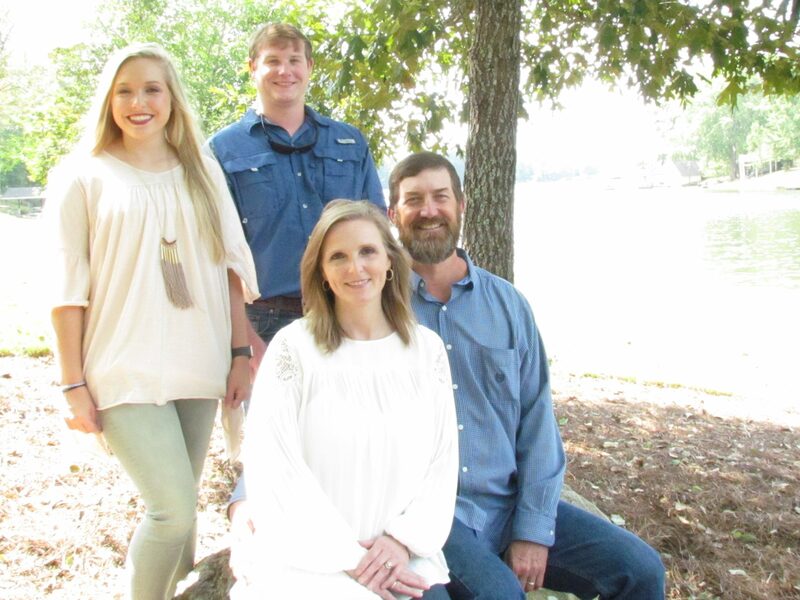 Just to name a few–zucchini, lima beans, okra, cabbage, or celery. Add your favorites and make it family friendly. In a large pot, brown ground beef, sausage, and onion. Cook until meat is brown; drain. Add the rest of the ingredients. Bring to a boil then reduce and simmer for an hour. Told you it was easy! My family likes to eat cornbread with soup. Of course, you could always make a loaf of homemade bread or pull out some saltine crackers. 1. Use a large stockpot. 3. I use frozen vegetables–especially during the winter–you use what you like and have on hand–canned or fresh will work as well. 4. Don’t overcook your potatoes. You want them soft, but not mushy. 5. You can use beef broth if you would like to add extra flavor. 6. This soup is great the next day and also freezes well. Be sure to check out my Taco Soup and Beef Stew. They will warm your bones on those cold winter days. 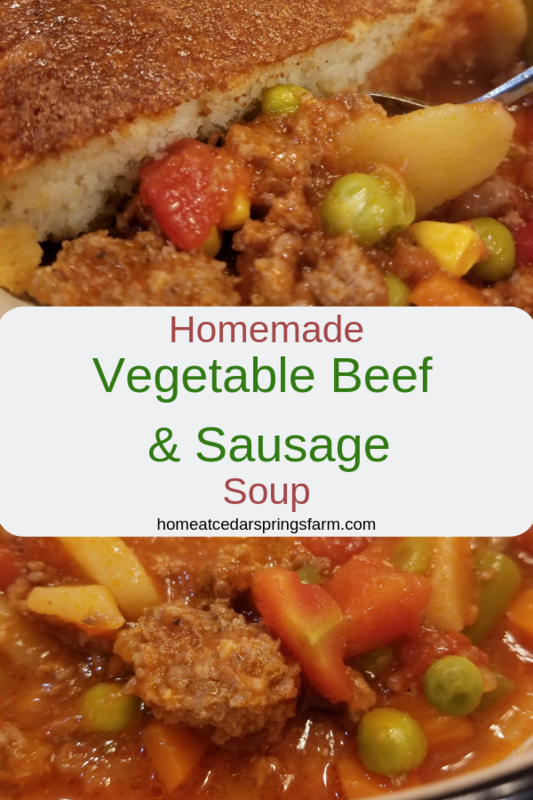 Homemade Vegetable Beef and Sausage Soup is loaded with ground beef, sausage, mixed vegetables, potatoes, onions, and tomatoes. It's hearty, comforting and so warming on these cold winter days. In a large pot, brown beef, sausage, and onion. Drain. Bring to a boil then reduce heat and simmer for about an hour. Serve with cornbread or crackers.